This recipe for green beans with parmesan and lemon butter sauce is a great way to dress up green beans for the holidays. Quick, simple and so delicious – an easy, no fuss side dish to add to your holiday meal. Preparing holiday meals can be hectic – so I wanted to share a simple recipe that doesn’t take very long to put together but is very flavorful. 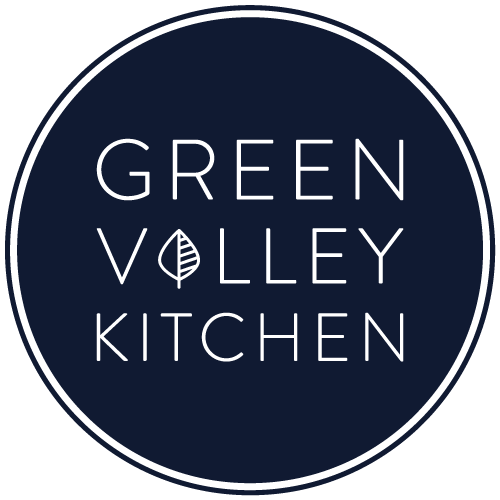 You start by cooking the green beans until they are tender crisp and then plunge them into an ice bath to lock in their bright green color. The parmesan and lemon butter sauce is what really makes this dish. The sauce is very simple – just a combination of frothy, melted butter with garlic and lemon. The green beans are sautéed in the sauce for a few minutes until warmed through and then tossed with finely grated parmesan cheese. Toasted pine nuts are added for some delicious nutty flavor. I want to wish everyone a happy Thanksgiving. I hope you and your family share a wonderful meal and have lots of laughs together this Thanksgiving. To save a little time, you can cook the green beans the night before and then add them to the sauce right before dinner is served. Just follow steps 1 through 3 of the cooking instructions and store the cooked green beans in the fridge overnight. The sauce comes together really quickly, so have all your ingredients prepped and ready to add to the sauté pan. The lemon will splatter a bit when added to the hot, melted butter – so add it carefully. When toasting the pine nuts, keep stirring the nuts continuously – they can burn very quickly. Green beans with parmesan and lemon butter sauce – a quick, easy and delicious way to serve green beans. Bring a large pot of water to a boil. Add trimmed green beans and cook for 3 minutes. While beans are cooking, prepare your ice bath by adding ice to a large bowl (fill bowl half way with ice) and add cool water so the bowl is filled about 3/4 of the way. When the green beans are ready, drain the green beans and add them to the ice bath. This will stop the green beans from cooking further and lock in the bright green color. When the green beans are cool to the touch, drain the green beans from the ice bath and set aside. In a large sauté pan, sauté the pine nuts for 1 minute over medium high heat. Stir continuously so they don’t burn. Remove pine nuts from the pan and set aside. In the same large sauté pan, melt butter until frothy over medium low heat. When the butter is completely melted, add minced garlic and sauté for 1 minute. Next add lemon juice and 8 twists of black pepper. Stir to combine. 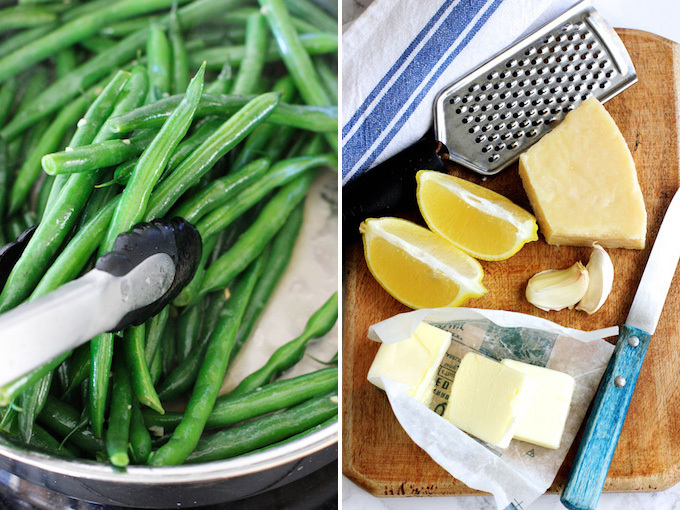 Add cooled green beans to the lemon butter sauce. Toss occasionally until the green beans are heated through – about 2 to 3 minutes. 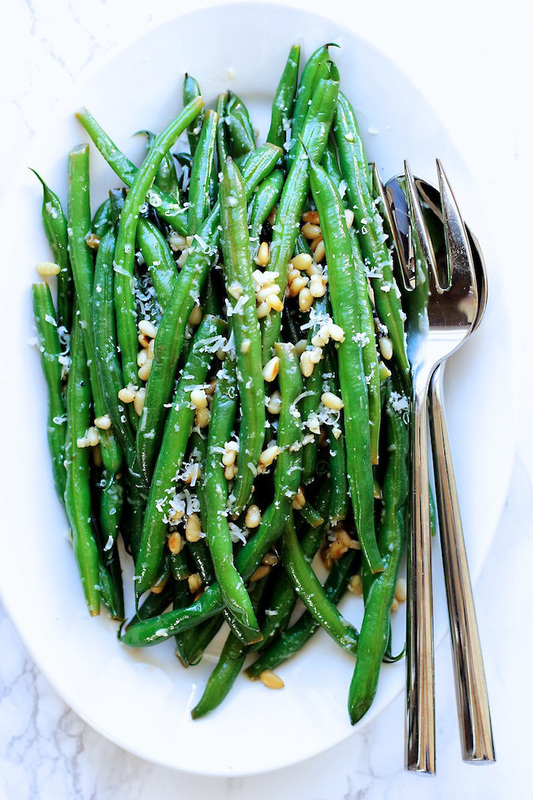 Add toasted pine nuts and the parmesan cheese to the green beans – toss to combine. I love green beans. This recipe looks delicious for any occasion. Pinned! Thanks for the pin, Natasha! Following and sharing. Have a great day! Thanks so much, Robyn! Hope you’re enjoying the holidays! 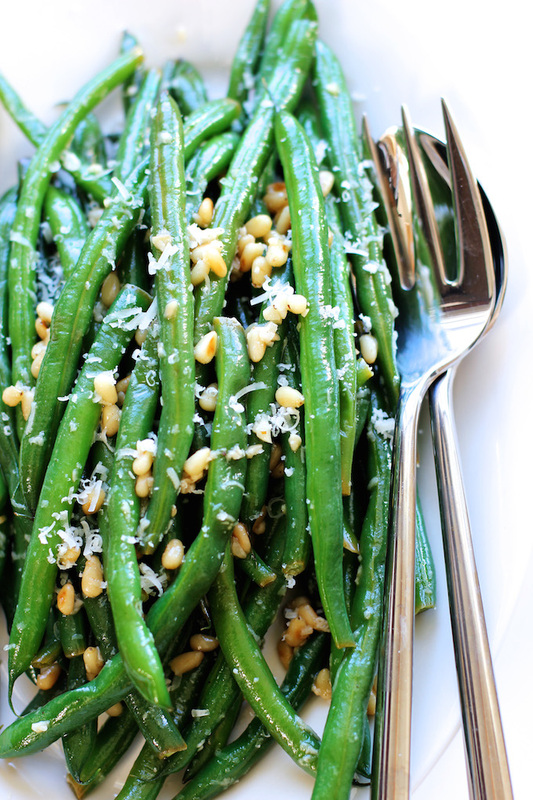 I love the looks of these green beans, they look just perfect for a holiday side dish! And they’re so pretty! Green beans are some of my favorites but I’m usually lazy and just steam them. These one sound amazing and I love all that lemon butter sauce! I hope you had a great Thanksgiving! Thanks, Izzy – hope you had a great Thanksgiving too! I agree with sippitysup – these beans are a work of art! Oh my Geraldine – I cannot handle these pictures or the flavors you have going on here! My family will love this! While sadly, I missed out on this for Thanksgiving – there’s always Christmas and then, of course, every other day of the year where dinner is served! Thank you for sharing!! Thanks so much, Annie – these would be great for Christmas too – I’m planning on making them again for the holiday! Gosh these look incredible! The photo is fantastic, so vibrant. Thanks, Gregg – you’re right – green beans and Thanksgiving just go together. My green beans looked exactly like the ones in your photo, and tasted great, almost shockingly great you might say! I love the simplicity of the green beans…all those flavors just enhance the freshness of the green beans! So pretty too!!! I completely agree about green beans – simple is best, Cheyanne. Nothing more depressing than a drab green bean! Wishing you a lovely, peaceful Thanksgiving, Cheyanne. Thanks so much, Traci. Wishing you and Rob a wonderful Thanksgiving! And thanks for the photo compliment, Traci – coming from you (and all your gorgeous photos) means a lot! What a GORGEOUS photo Geraldine! I just want ALL the beans on that plate! They sound perfectly yummy as a Thanksgiving side dish! Thanks for sharing and have a wonderful holiday!! Thanks so much, Mary Ann. I’m a big green bean fan – and could definitely eat the whole plate as well! Hope you have a wonderful Thanksgiving with your family! That’s great, Robin! I hope you and your friends enjoy them. Wishing you a wonderful Thanksgiving! groan~ WHO knew how addictive these were!? I’ve had to buy fresh green beans THREE times since reading this recipe because my family is demanding them for each meal! LOL They are “claiming” to be “Recipe Testers” for our Thanksgiving Dinner…bless them! THANKS for this wicked good recipe. Thanks so much for letting me know the recipe was a big hit with your family! I completely agree about them being addictive. Tell your recipe testers they are doing a great job! Hope you and your family have a wonderful Thanksgiving!